SAN JOSE, CALIF., May 21, 2009 – Acer, the third largest vendor in the PC market,(1) today announced the new Acer® Aspire easyStore Home Server for customers in the United States. Designed for households and home-based businesses with multiple PCs, Aspire easyStore offers a simple way to network home computers, centralize, share and protect digital data as well as access it remotely from anywhere in the world. Outfitted with Microsoft® Windows® Home Server, the Aspire easyStore offers many benefits. For example, parents can access their children's homework while traveling for business. They can also upload videos and photos from sports events or summer vacations to the server, even while away from home. At any time, from anywhere, every family member with a PC in the home network can access photos, videos, music and other documents from the home server. This centralization of digital data saves significant time by eliminating the need to transfer data from one PC to another, every time someone wants a photo, video or other document that's stored on another PC. It's also a safeguard. If a netbook or notebook is damaged, lost or stolen, users don't lose their data along with it, since it's backed up at home. In addition, when a new system is added to the network, it's quick and easy to upload data from the computer to the server. "The trend of multiple computer devices per household continues to grow, particularly with regard to mobility. A significant pain point for consumers is how to consolidate and protect their digital data that's spread among multiple devices," said Sumit Agnihotry, Vice President of Product Marketing for Acer America. "Aspire easyStore is the ideal solution for networking home PCs and providing round the clock data protection. Offering remote access to digital data at home from anywhere in the world and automatic daily back-ups, it's the perfect companion to netbooks and notebooks. It's an extremely practical and affordable way to simplify and manage one's personal digital life." "It's great to have Acer as a valued partner for Microsoft's Windows Home Server in North America. Acer's solution gives consumers new options for purchasing Microsoft Windows Home Server. And Acer's reputation as a key contributor in the PC and consumer electronics field further demonstrates the industry's commitment to this growing product category," said Kevin Kean, General Manager, Windows Home and Small Business Server Group at Microsoft. 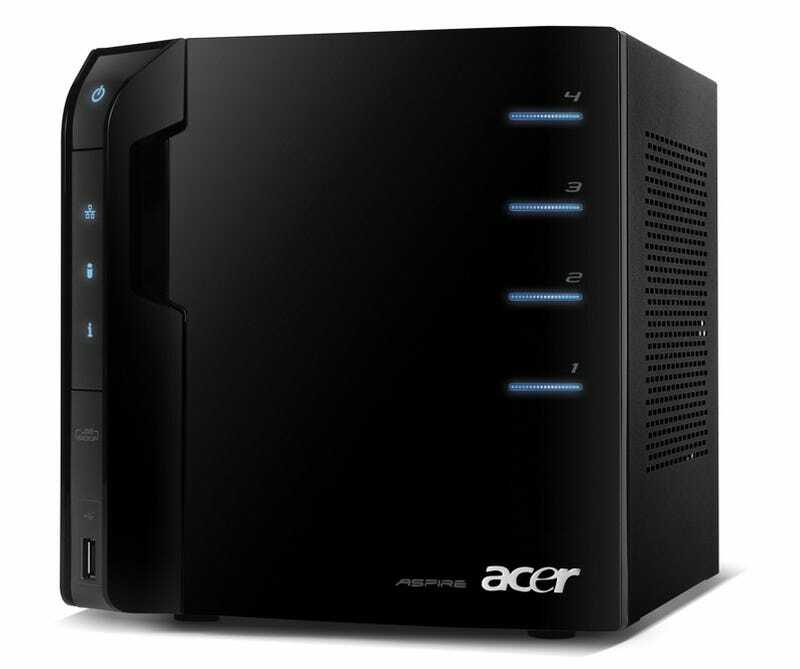 Smaller than standard servers, the handsome black tower measures just 8.3-inches (H) x 7.8-inches (W) x 7.08-inches (L). HDD status LEDs emanate a soft blue light and complement the handsome black bezel. The power button is located on top for easy access and reach. One-touch USB copy enables quick file uploading. Users just plug in the USB device and push the button. The data is automatically sorted and stored by file type into designated folders. Outfitted with an Intel® Atom™ processor 230 and 2GB DDR2 memory, the Aspire easyStore AH340-UA230N Home Server has the guts to organize and back-up files quickly. The 1TB hard drive and three hot-swappable hard drive bays available for storage expansion provide enough room for filing, storing and backing-up a vast library of songs, videos, photos, games and documents. The hot swappable HDD cage enables users to increase their data storage, by adding up to three 3.5-inch internal hard drives, which means it offers up to about 7 TB of total data storage. The cage is outfitted with release levers for each drive to keep them secure. In addition, a recovery/reset pinhole provides additional data protection by enabling system restores and data recoveries with just one-touch. The server works with DLNA (Digital Living Network Alliance) 1.5 Certified Home Server (DMS) and digital media player (DMP) to enable music playback as well as photo and video viewing on a TV. For internet security, Aspire easyStore comes with a six-month free trial of McAfee Total Protection Service. Microsoft® Windows® Home Server centralizes digital media in one location, making it easy to access files, photos, videos and music from any PC on the network. It also protects critical data by creating an image-based backup of every home computer every day, so users can restore a single file or an entire PC. With Windows Home Server, users can access the home network from the office or the road, for full access to their files and applications, just as if they were sitting in front of their home PC. The Acer® Aspire easyStore AH340-UA230N Home Server is available in the U.S. via leading online technology retailers and authorized resellers.